Nias is a remote and rather small island off the northwest coast of the world’s sixth largest island, Sumatra. Yet as difficult as it is to get to, a Neolithic society with an extensive megalithic culture featuring ancestor worship and headhunting evolved an especially high artistic expression, possibly enhanced through contact with belief systems arriving from India in the second half of the First Millennium. European missionaries, active since the 19th Century, brought back the heathen idols of the pagans to show their congregations and solicit funds for further soul saving. However not everyone reacted in horror, as the works were greatly prized by ethnographic museums and collectors, including the Surrealists. 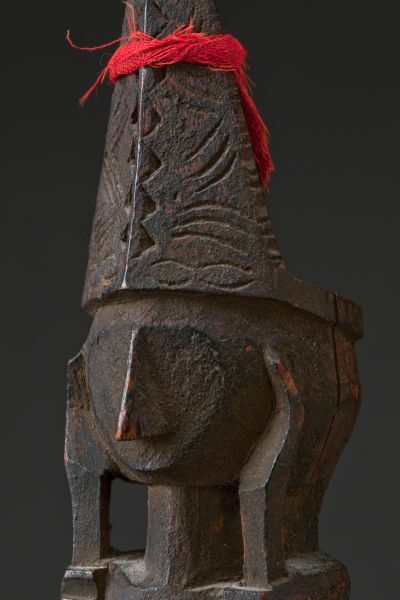 Man Ray famously took a shot of an Adu Zatu ancestor figure now in the Musée du quai Branly. Assembled here are a group of ten works of art from Nias, some showing special forms and stylizations, others featuring exotic materials, some figural, others abstract but unified by a common sense of indigenous aesthetic, a beauty intended for the eyes of the living and the dead.